When it first opened in the 1860s the Suez Canal revolutionised international trade by cutting the travelling distance from India and the Far East to Europe at a stroke. The new route also altered the world’s geo-political landscape; suddenly gifting Egypt a new military, political and economic significance, which was to prove both a blessing and a curse. The Canal was originally conceived and financed by the French, but the British government quickly realised its significance and took advantage of the Egyptian government’s weak financial position to buy a stake from them in the 1870s. Over time shares in the company controlling the canal evolved into direct control over Egypt and neighbouring parts of the Middle East. The Canal soon became an essential part of British imperial thinking, at once a powerful “key” to control the world’s oceans and trade, but also a weak spot, vulnerable to enemy attack and something to be carefully guarded. The Canal’s importance was cemented in the early part of the twentieth century as the region’s oil flowed through the narrow channel supplying both industry and crucially the Royal Navy, which had switched from coal power to oil in the first decade of the 1900s. Now the Canal lies firmly in the hands of the Egyptians thanks to President Nasser’s nationalisation in 1956, a bold move which resulted in a military intervention by the British and French who were set to lose their prize Middle Eastern asset. But in turn these fading imperial powers were ruthlessly undermined by a lack of US support (who threatened to pull the plug on British debt), at once ending British illusions about its superpower status and pushing the French into a long term rapprochement with Germany. For the Egyptians it was a moment of national triumph, but a short-lived one, for the disastrous 1967 Arab-Israeli war saw the country defeated and Egypt closed the canal for 10 years. 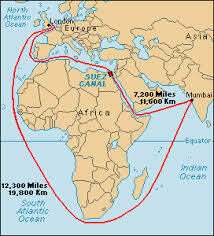 The Canal was eventually reopened and today ownership over the canal provides a good income from shipping fees and a useful diplomatic tool for Egypt, who can opt to close the canal to traffic to countries (like Israel) it takes issue with. The Canal also helps bolster Egypt’s reputation as the geo-political lynchpin of the Middle East, despite a patchy record of political and economic management. Its central position in the Middle East and its stewardship of the Suez Canal also helps the continuation of US support in the form of military and diplomatic aid. Despite the uncertainty of recent years, Egypt is considered “to big to fail” particularly by the Pentagon and Washington military establishment. It will come as no surprise that Egypt is the second largest recipient of US military aid. The Egyptians also maintains strong links with China, bilateral trade has blossomed in recent years, as has Chinese direct investment in the country. Beijing’s increasing economic presence across the Middle East suggests that it will eventually get further drawn into the regions’ politics. While it presently has good relations with all the major economies of the region, it could at a later date be forced to choose allies and enemies. If that point arrives you can be sure Beijing will take into account the massive volume of Chinese goods passing through Suez on their way to Europe before endangering relations with Cairo.